Home / Buying Guide • Sensitive Skin / What are the Best Electric Shavers for Sensitive Skin? Before answering the question of what are the best electric shaver is for your sensitive skin, try considering your shaving habit first. Try to know how frequent do you shave and try to observe at least the type of your hair. When you know these things you will just end up choosing either a rotary or foil shaver irregardless of the brands. As per review, it is observed that foil shaver could be more advantageous if you have a sensitive skin for the fact that it has some form of metal that acts as blade cover making it more gentle to your skin. However, the usage of this would still depend on your shaving habit as foil shaver is not good for long hair. The best and most common thing to do whether or not you are using a foil or rotary shaver is to see to it that the blades are always sharp. It must be sharp enough such that it can cut the hair easily. Notice that if the blade is getting duller you need to shave an area of your skin two to three times, making it susceptible to rashes and even wounds not to mention the incomplete cut of the hair. This means the shaving is partially complete as the hair is not removed properly. Wet shaving capabilities – If you are one of those with sensitive skin, wet shaving is highly recommended. A good shaver should allow you to use gel or lotion when shaving. Some shavers are also waterproof. Type of hair– It is good to allow your skin to recover for some days after shaving. This means you should look for a shaver which is able to trim long hairs which grows in different directions. Sharp blades – The blades should be sharp enough to prevent pulling and tugging. Sharp blades minimize the number of passes when shaving. Shaving head – The shaving head should not get hot when shaving. Some shaving heads becomes hot due to friction caused by blades and foils. It is also advisable to lubricate the blades regularly to reduce the amount of heat produced. This also protects the blade from wear and tear. Speed of the motor –A shaver with a powerful motor is better since it makes shaving to be more faster and smooth. It allows you to pass the shaver on your skin once or fewer times as compared to when you are using a less powerful motor. In addition, you do not need to apply pressure when shaving. If you are searching for the best shaver, you just need to consider the above features. The above factors will help you narrow down your options from the numerous brands available in the market today. For those with a sensitive skin, it is highly recommended to check the type of shaver you intend to buy for you to get the best results. How to Determine the Best Electric Shavers for Sensitive Skin? So whether or not you decide to choose a rotary or foil shaver, whatever the brand and price range is, the next time that you must consider is the capability of your shaver to go with a wet or dry shaving process. This could be the final thing that you need to consider on the product perspective. You need to check if the shaver that you have or you want to have can do dry shaving or not. 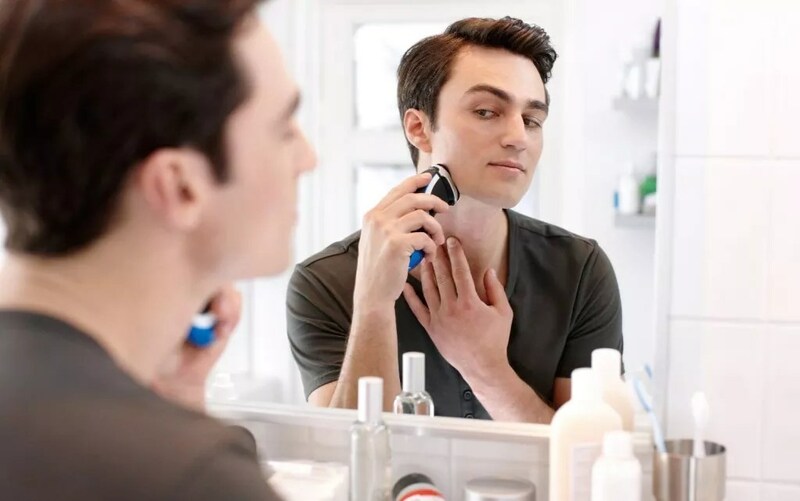 Once you have these details then you must have all the considerations to take in choosing the best electric shaver for your sensitive skin. Nonetheless, make an observation first if dry shaving or not is best for your skin and from there you can move forward with the same style. Having the best electric shaver in this world would not be enough if you don’t know how to use it properly. You can use a good demo from someone who already have tried the make and model that you have. You can also take a look carefully at the manual provided with the product. At cases some would experience cut skin when using new and sharp blade electric shaver. This situation we want to avoid so that your sensitive skin will not be damaged further. It is important to have a technique and correct execution when shaving is done. In time take time to be more familiar with the electric shave that you bought. You may observe that for a couple of weeks until a month. The shaving techniques as a whole is not the only main point here. The technique of maintaining your electric shaver must also be given utmost importance. So take good care of your shaver and see to it that is always in good condition.